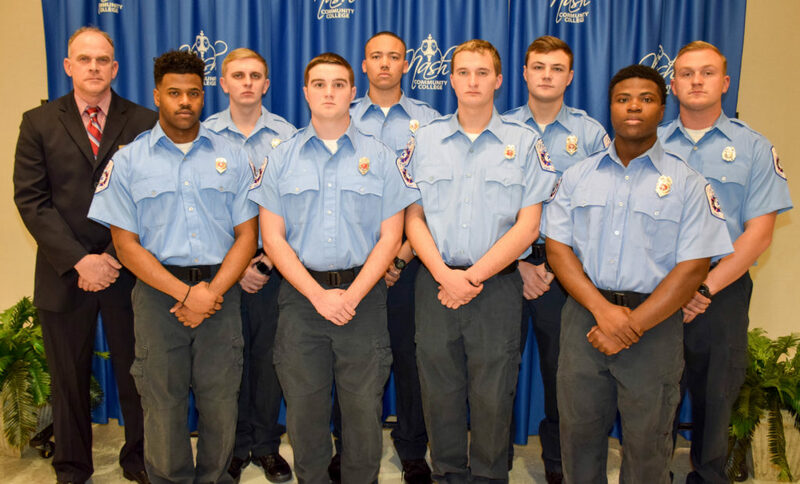 Students in Nash Community College’s Recruit Firefighter Training Academy #080718 were recognized for program completion in a ceremony held January 23, 2019. NCC President Dr. Bill Carver thanked fire service agencies for their partnership. “You see the people in uniform here tonight who are supporting these cadets, and helping the College spread the word about the program, lending their expertise,” he said. “This program cannot be done by NCC alone,” he said. Nash Community College’s fire training program is designed to provide individuals and firefighters the information and skills needed for modern firefighting through a variety of learning experiences and training scenarios. During the ceremony, Olen Bass of Red Oak Fire Department was honored with the Academic Excellence Award for earning the highest grade point average. Donte Richardson was recognized with the Flame Award, an honor given to the recruit firefighter who is voted overall “most outstanding” through the majority vote from the students in the class. Consideration is given for the highest level of teamwork, fellowship, enthusiasm and cooperation demonstrated by the members of the class. The class presented the Instructional Excellence Award to instructor Michael Strange, captain with Rocky Mount Fire Department and volunteer with Battleboro Community Fire Department. The award is given by the students to the instructor who is deemed most influential, motivating and approachable throughout the training. NCC fire classes are often delivered directly to firefighters through training sessions held in local departments and at training sites throughout the community. For more information, visit www.nashcc.edu/fire. NCC Director of Fire and Health Services, John Winstead left pictured with graduates, from left to right: Julius C. Bates (Nashville Fire Department) of Charlottesville, Virginia; Tyler D. Elman (Hopkins Fire Department) of Cape Coral, Florida; Samuel W. Greene (West Mount Fire Department) of Nashville; Donte Richardson (Arcola Fire Department) of Arcola; Olen J. Bass (Red Oak Fire Department) of Mathews, Virginia; Zackary E. Tant (Middlesex Fire Department) of Middlesex; David R. Baines (Middlesex Fire Department) of Middlesex; Carson T. Brooks (Zebulon Fire Department) of Zebulon. Click to watch the ceremony video or to view photos.